or get out and explore. There are three QEII Reserves, which are available to explore at your leisure. formations and the natural beauty surrounding you is quite breathtaking and it is well worth it. The wild life includes goats, turkeys, peacocks, hares and birdlife. if you are after some farm time. peaceful surroundings that this unique part of New Zealand offers. Definitely a great opportunity to detox and recharge your batteries! 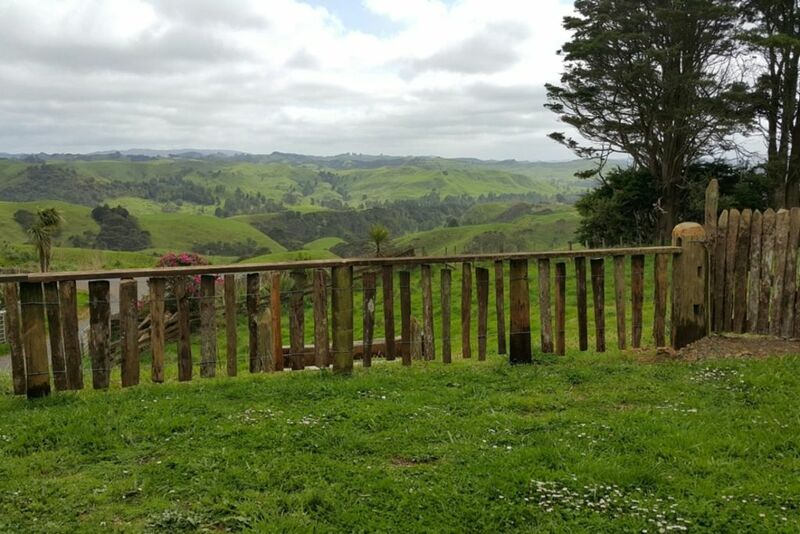 Not far is also the Waingaro Hot Springs and several country pubs such as the Rangiriri Hotel. Mercer is back on SH1 where there is Mercer Cheese which is worth a look and other amenities. Down SH1 a bit further there is also the Greenstone Museum and shop at Te Kauwhata which is worth checking out. This property is definitely for those looking to unwind. Bring everything you need with you as the nearest supermarket is 40mins away at Tuakau / Pukekohe. Cellphone coverage is limited for Vodafone customers so this really is your chance to get away from it all. Couple or single person preferred due to the size of the cottage. No pets allowed as this is a working farm. Must respect that you are on a Farm and close all farm gates that you open. Great place to escape to. Lovely community. Thanks! For six days I enjoyed the company of Lucky, the 10 week old Santa Gertruidos bull calf. From his balcony paddock high above the sprawling Waikato farmland beneath we surveyed ever changing beautiful rural vistas. Lucky, with his three cute lamb attendants, didn't care, but he was there for me as company on this green, green voyage. With subtle nudges from Edgar, who was often there, I got exercising deep into the green textured hills, valleys and plateaus. The National reserves incorporated pleasantly into the farmland were the highlights of my frequent ventures into that lush green landscape. Despite six days rain free the greenness held up with meadows deep and clover rich and honeyed Manuka trees awaiting their dew. Shane, the farmer, shared his stories without glory. A salt of the earth chap with a big pointed hat. You won't get a straighter man than Shane I surmise. Times are changing but long live this glorious paddock overseeing the cloud symphony above and green harmony below. Many thanks to Nona for arranging it all, Edgar for his friendship and advice and Shane and his wife for showing how a big farm is run today. It all takes a huge heart. Independent people of heart is what I got from meeting the characters in this brief sojourn. The beautiful countryside stretching far away, so grand yet unobtainable without the management skills of the characters in this play! I stayed a full week at this Fabulous little cottage in the hills, I did a full 7 day digital detox, that was bliss, I was surrounded by the most beautiful countryside for walking and the most warm and welcoming hosts. I will be returning again for another RESET :) Thank you so much for making this space available. Lovely place for a getaway. Look forward to returning for a longer visit. To have a rest and recoup this location is ideal. To have a rest and recoup this location is ideal. The property is right size for 2 people. We have enjoyed the stay.